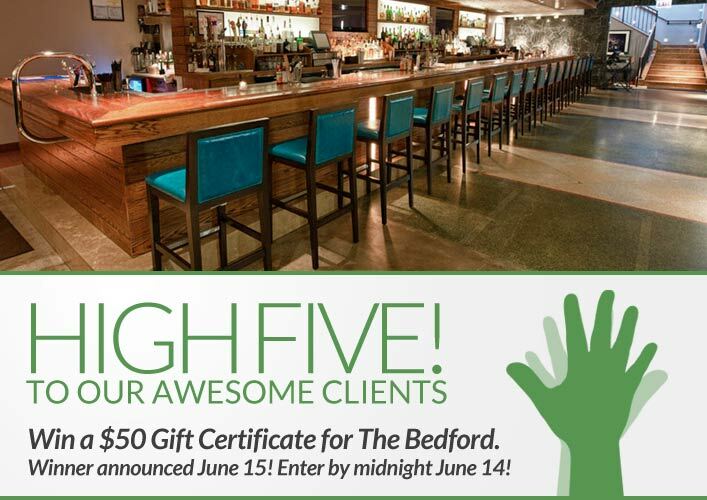 Win $50 Gift Certificate to The Bedford! We are excited to announce our new High Five Giveaway Program. On the 5th, 15th and 25th of each month we will give away a $50 gift certificate to one of our favorite Chicago spots. Our first giveaway starts now! We are giving away a $50 gift certificate to The Bedford, one of the coolest restaurants/lounges in Chicago. To enter, simply answer the question below in the comments section of the blog. Inspired by the Supper Club experience of a bygone era, The Bedford puts a modern-day twist on the concept by offering more than just a restaurant. Underground but not exclusive, this Wicker Park outpost offers a full nightlife experience without the formality. Come into the reclaimed landmark bank for a drink or small bite, and end up staying for a full meal, music and more. Sip on one of our signature cocktails in the one-of-a-kind lounge in a former bank vault; experience our boutique wine, beer and spirits selection at the bustling bar; or enjoy our celebrated cuisine in the intimate dining room. The Bedford is located at 1612 West Division Street. Visit their website at www.bedfordchicago.com to view their menu and see pictures. What is the name of the hair trend first made popular in 2007 by supermodel Giselle bundchen that remains popular in 2012? It is the perfect shade between blonde and brunette. Now, just add a comment to this post with the right answer to be eligible to win! The winner will be announced on June 15. Entries must be received by midnight on June 14. The “bronde” haircolor is the perfect shade between blonde and brunette and is the name of the hair trend first made popular in 2007 by supermodel Giselle bundchen that remains popular now! That hair trend is called the “bronde” shade. Bronde is the perfect shade between blonde and brunette that Giselle sported and is still a popular trend today! My guess is “ombre”. I say that because I have a beautiful ombre gown that transcends from purple to teal to soft yellow in the same way this color style does!